Guns N’ Roses will play its first-ever concert in the state of Hawaii this fall. The reunited trio of Axl Rose, Slash and Duff McKagan will perform at Honolulu’s Aloha Stadium on Saturday, December 8 as part of their Not In This Lifetime world tour. A Citi cardmembers presale runs Monday, October 8 at 10:00 a.m. HST until Thursday, October 11 at 9:00 p.m. HST through Citi's Private Pass program, with general public tickets going on sale Friday, October 12 at 10:00 a.m. HST at Ticketmaster and at the Aloha Stadium box office. The Hawaii gig follows a fall series of live dates for the band that feature several shows in the Far East and stops in Abu Dhabi and South Africa in November. 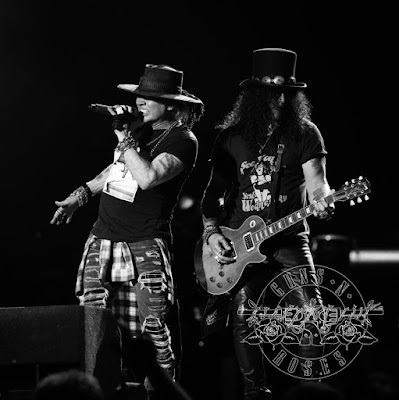 Guns N’ Roses launched the reunion tour with a rare club show at The Troubadour in Los Angeles on April 1, 2016; now in its third year, the trek is among the top five biggest-selling concert tours in music history with sales of more than $500 million. Three decades after its arrival, the project remains the biggest debut album of all time with more than 30 million copies sold worldwide.